A big part of my historical research involves looking at old maps. They often allow me to verify residences and land ownership as well as helping me to compare the built landscape that I see today with the historic landscape. One of the most valuable maps in this respect is the 1858 Hopkins map of Cuyahoga County. The city of Cleveland was much smaller than it is today. Outside the city limits, it shows land ownership and the locations of houses. The landscape has changed so much in the past 150 years that it can be hard to see the relationships between the roads illustrated on Hopkins' map and the roads that exist today. To that end, I've spent some time playing around with Google Maps. This map shows the streets in East Cleveland township in 1858, according to the Hopkins map published that year. There are some roads that are popularly known to be older: Euclid; Superior; and St. Claire. There are others that one might suspect, because they are major roads: East 55th and East 105th Streets. The problem with looking for extant historical fabric on these streets is that they have remained major streets. They have fostered commercial growth, and with commercial growth has come the loss of residential structures. The streets worth really looking at are those that one might not have realized were older streets: Addison; Crawford; Ansel; Lakeview; Eddy; and Coit. I haven't been able to find much along Crawford and Ansel, due primarily to redevelopment, much of it at the turn of the century. 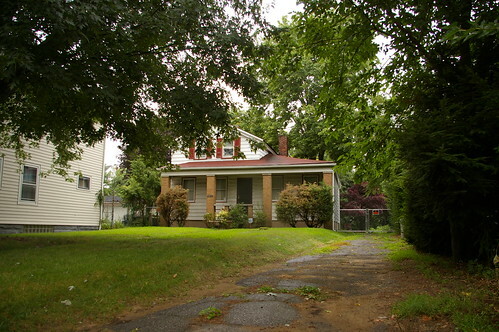 The Banks-Baldwin Law Publishing Co. headquarters was originally located at 757 Ansel Rd, before it was moved. On and near Addison, just north of Superior, there are two Greek Revival farm houses, one that I've written quite a bit about, and the other, shown here, which hides back a bit from the road and remains a private residence. These other streets are worth checking out - take a look at these maps, and at the older streets in your neighborhood, and see what you find. There are surely at least a few interesting buildings on Coit, Eddy, and Lakeview, and perhaps on the streets just off them as well. I know that there are more hidden gems out there. Let me know what you find. The one at 1158 (?) 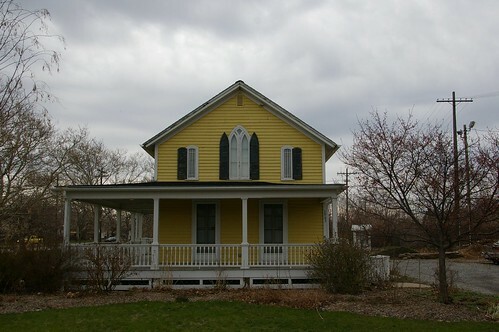 Addison was the Hecker farmhouse. I grew up on Hecker Ave. near there. Our friends the Hlad family lived there ca. 1950s until a couple of years ago, and Vera, their matriarch, kept in touch with the Hecker descendants, so she was well aware of its age. A barn remained on the property until the 70s at least. Thank you, thank you for this terrific blog, I am becoming obsessed with it! That's so exciting! Might you by any chance have some old family photos showing the house and perhaps the barn? They would help to make a really interesting narrative here, I think. I don't have any, but I'll contact my friends who lived there and see if they do. Just wanted to say I really, really appreciate this blog! Keep it up! Also, "The Yellow House" on Ansel is amazing. Perhaps you also know someone in that neighborhood who might be interested in this house - I really don't want to see it bulldozed. Christopher said, "...with commercial growth has come the loss of residential structures." This is a great point that implies more than we realize. 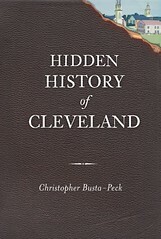 Cleveland really came to maturity at the end of the 19th century. The market forces were so great nearly any existing structure was expendable in the massive expansion. As such there is relatively little left from our times before the 1890's. But it also makes these structures all the more interesting when we find them. You ought to see what Steve Titchenal and Roy Larick are doing with historic and modern maps!